Queen Aliquippa (born 1670?-1700s?, died December 23, 1754) was the leader of a band of Mingo Seneca Indians, and was recognized by one of the founding fathers of America, George Washington. Capable of leading a large group of people. Able to fight for what she believes in, and is able to convince others to do the same. Is not afraid to cross cultural boundaries, or assert herself. Queen Aliquippa was the great and respected leader of a Mingo Seneca tribe that lived along the Ohio River. The members of the tribe had great respect for her and held her in high regards. Being the leader of this tribe also meant that she grabbed the attention of very influential individuals such as George Washington when he was serving as a general early in his career. Being the leader of a tribe also gave her great experiences in leading, organizing, and directing a large group of people. Queen Aliquippa’s dedication to aiding the British also demonstrates her commitment to a cause, her no nonsense attitude, and her fearless leadership. Queen Aliquippa had no formal education, but she probably learned her leadership skills from her father, who was a village chief before her. Although she never received any formal awards, Queen Aliquippa is recognized as a great leader by influential people that were traveling through Pennsylvania at the time when she was the leader of her tribe. People like Conrad Weiser, Pennsylvania’s ambassador to the Indian nations at the time, George Washington, a young General at the time, and the French explorer Celeron all recognize her as a woman of power and influence among her tribe. Queen Aliquippa did not write anything (that we know of) and she never had anything written published. There are second hand accounts of meetings with her written by George Washington, Conrad Weiser, and Celeron, but nothing Queen Aliquippa said was ever recorded. 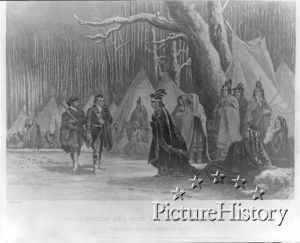 Queen Aliquippa became the leader of a Mingo Seneca tribe and remained the leader of that tribe until her death in 1754. She was able to influence people of great importance and rank like George Washington, and through her alliance with the British, she was able to help them gain momentum, which ultimately led them to establish what is now the United States of America. Queen Aliquippa did no volunteer activities except ally herself with the British.